Aston Villa boss Steve Bruce says his players must take some of the blame after his side were crushed at Sheffield United. First-half goals from Jack O'Connell, Mark Duffy and Oliver Norwood set the Blades on their way to a fourth successive second-tier victory. A disastrous afternoon for Bruce continued after the interval as Billy Sharp pounced on some slapdash defending to add a fourth goal, before Anwar El Ghazi's consolation effort. 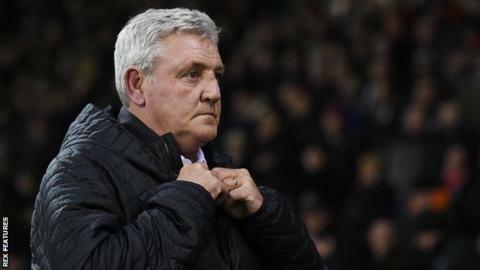 "Ultimately I take the responsibility because I pick the players, but some of them have got to have a look at themselves too," Bruce told BBC WM. "From back to front we were awful in a lot of aspects, but I've mentioned it far too many times, it's arguably the worst one I've faced, but that's the way it is. "We can talk about tactics and 'you don't know what you're doing' and 'dinosaurs are going to come out', but at the end of the day we didn't put our boots on." Bruce was without two of his newest loan recruits as Yannick Bolasie was unfit while Tammy Abraham was ineligible - while he revealed that John McGinn, Alan Hutton and Jonathan Kodjia played despite not training all week due to injuries. It could have been far worse for the visitors - who suffered their biggest loss since they were relegated from the Premier League in 2016 - as Norwood hit the post after providing the cross for O'Connell's early headed opener. There was also a goal ruled out for offside for Sharp before Duffy's 20-yard shot found the bottom corner and Norwood snuck a free-kick inside Orjan Nyland's near post. Bruce opted against making any half-time changes and may have been regretting that decision when Sharp continued the rout after the restart with an unstoppable shot into the roof of the net. Lille loanee El Ghazi scored his first goal in Villa colours to reduce the arrears, beating the offside trap before firing past Dean Henderson. However, it proved nothing more than a consolation for the Midlands club, who were thankful to the offside flag once more when Sharp thought he had added his second and the Blades' fifth. Bruce was taunted by his own fans as the game ended - the travelling Villa supporters singing that he will be 'sacked in the morning'. "When you're the manager of Aston Villa and you get beaten in the manner we did today you've got to accept the flack that comes your way," he added after a fifth successive game without a win. "Whether that's going to be the case, I sincerely hope not, but I've got to be expected to face that because the first half was my fault." Bruce added: "Is there anybody better? I'm sure people are going to ring in and say 'yes there is', and if that's the case so be it." "It's a really good performance against a powerful club in this division. The players can be delighted individually and as a team. "We're a humble football club and we need to keep our feet on the ground. It's a great result and performance, we can't get away from that, and I don't want to take anything away from the players. "It's a good day for us and obviously not a great day for them, but there's a long way to go and a lot of football to be played." Match ends, Sheffield United 4, Aston Villa 1. Second Half ends, Sheffield United 4, Aston Villa 1. Corner, Sheffield United. Conceded by James Chester. Attempt missed. James Chester (Aston Villa) right footed shot from the left side of the box is high and wide to the left. Assisted by Jack Grealish with a cross following a set piece situation. Rushian Hepburn-Murphy (Aston Villa) wins a free kick on the left wing. Attempt blocked. David McGoldrick (Sheffield United) right footed shot from outside the box is blocked. Assisted by Oliver Norwood. Jack Grealish (Aston Villa) is shown the yellow card for a bad foul. Conor Washington (Sheffield United) wins a free kick in the defensive half. Substitution, Sheffield United. Conor Washington replaces Billy Sharp. Delay in match John Egan (Sheffield United) because of an injury. Attempt blocked. Jonathan Kodjia (Aston Villa) right footed shot from outside the box is blocked. Assisted by Neil Taylor. Substitution, Aston Villa. Neil Taylor replaces Alan Hutton. Substitution, Aston Villa. Rushian Hepburn-Murphy replaces John McGinn. Offside, Sheffield United. Oliver Norwood tries a through ball, but David McGoldrick is caught offside. Substitution, Sheffield United. Daniel Lafferty replaces Mark Duffy. Attempt saved. Conor Hourihane (Aston Villa) left footed shot from outside the box is saved in the bottom left corner. Assisted by Jack Grealish. Offside, Sheffield United. David McGoldrick tries a through ball, but Billy Sharp is caught offside. Corner, Sheffield United. Conceded by Conor Hourihane. Corner, Sheffield United. Conceded by Ørjan Nyland. Attempt saved. David McGoldrick (Sheffield United) left footed shot from the centre of the box is saved in the centre of the goal. Assisted by John Lundstram. Alan Hutton (Aston Villa) wins a free kick on the left wing. Substitution, Aston Villa. Conor Hourihane replaces Axel Tuanzebe. Substitution, Sheffield United. John Lundstram replaces John Fleck because of an injury. Goal! Sheffield United 4, Aston Villa 1. Anwar El Ghazi (Aston Villa) right footed shot from the centre of the box to the bottom left corner. Assisted by Glenn Whelan. Attempt blocked. John McGinn (Aston Villa) right footed shot from outside the box is blocked.